Could there be anything more charming that a bowtie on your little Mr.? The answer…YES! 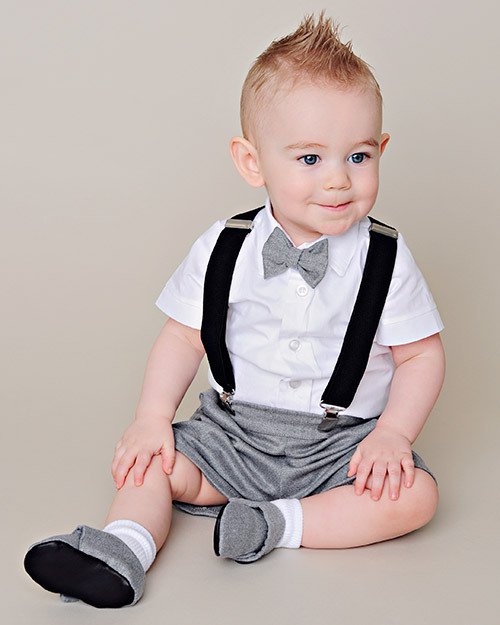 Our newest One Small Child design combines the timeless bowtie with adorable black baby suspenders. The result is too cute for words! But we couldn’t stop there, we had to add cashmere-soft slack style shorts. This look will have everyone pulling their cameras out to capture the adorableness. Cute + Great Features Too! And last, but certainly not least, you get your choice of a classic bowtie or a “big boy” neck tie. The best part is, both are removable! Did we mention the accessories that are available for this darling outfit? We have a newsboy’s cap that is a perfect match, not to mention it ups the handsome factor! Next are the matching shoes. They are made from the same fabric as the tie, shorts, and cap. A large strap crosses the foot and is secured with an exaggerated black button. The soles are made of soft black leather to accommodate unsteady walkers. The insides are fully lined with a soft satin for supreme comfort. If you are looking for a more formal attire check out our Derek 5-piece suit. 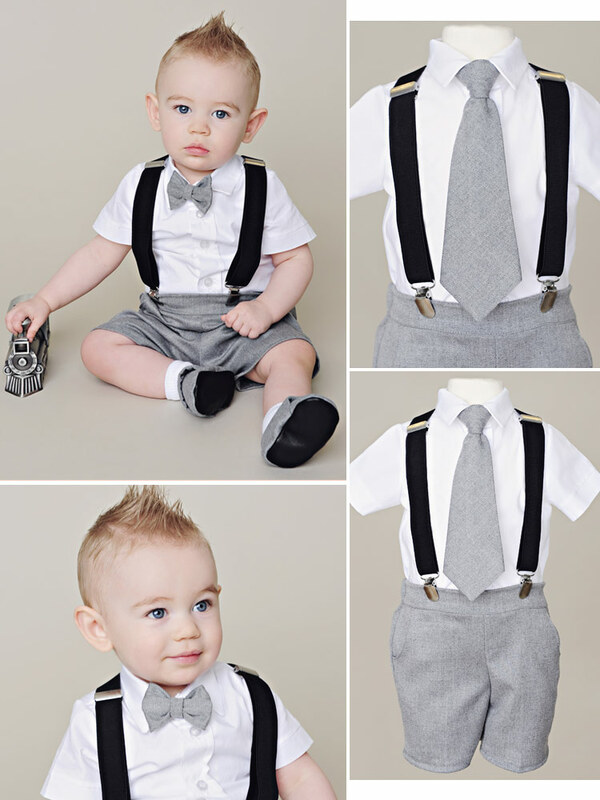 It is great for winter events while our Gray Suspender Outfit is great for warmer ones. 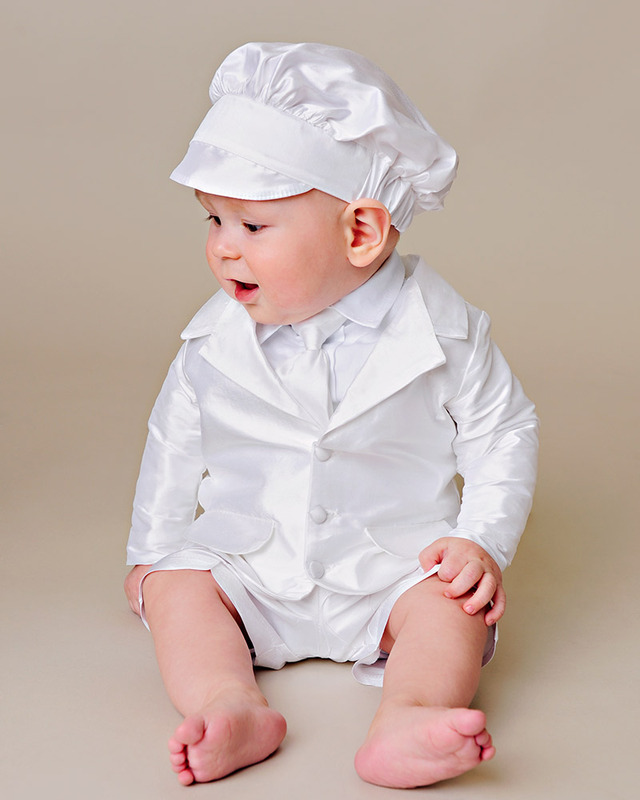 Take a look at our newest addition to our line of baby boy occasion wear! 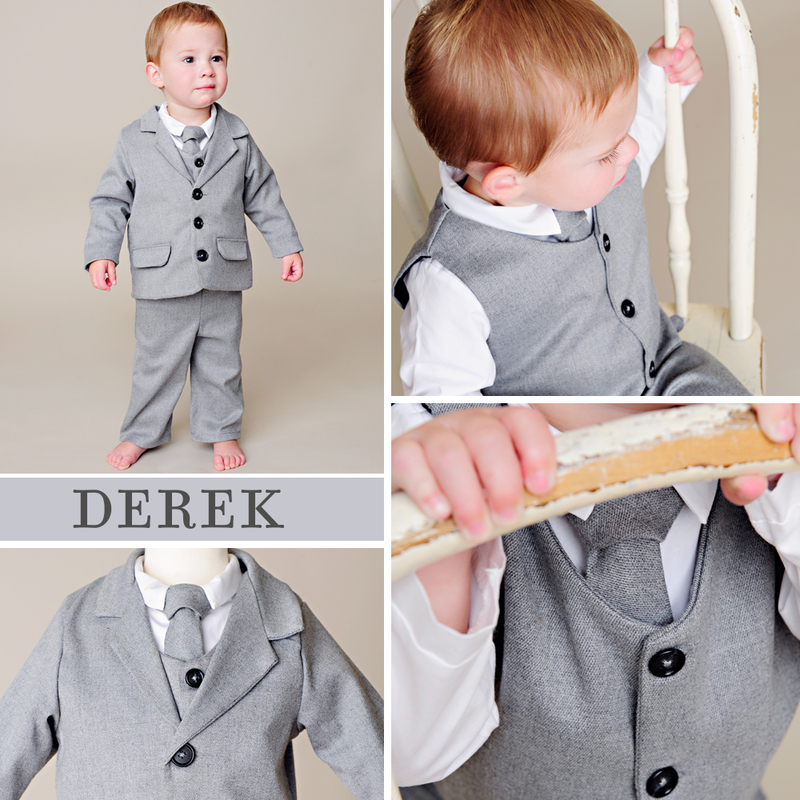 The Derek 5-piece suit is every bit as comfortable as it is adorable! Our classic bodyshirt starts is all. Made from a soft combed cotton, it’s perfectly white. It boasts long sleeves and a crisp collar. The amazing undershirt buttons up the front for style. Snaps close the crotch for quick and easy clothing. The Derek is made from an amazing poly-blend fabric that is called cashmere. And that’s how it feels. It is supremely soft to the touch. We know you’ll fall in love! Your little guy will appreciate the warmth and comfort of the Derek as much as you’ll adore the way he looks. The Derek suit coat is lined and adorable! large shiny black buttons close the front. The lapels look just like daddy’s and end mid to lower chest. Two faux pockets decorate the front of the jacket. A slit in the back of the coat provides tailored comfort. A matching gray vest sits comfortably beneath the suit jacket. The rounded neckline allows the vest to be visible when wearing the jacket, so you get the full effect of the outfit. Slightly smaller matching black buttons close the front. The front panels end in two handsome points for a fashionable statement. The Derek pants are simple flat front slacks. An elastic back makes for easy on and off. They are comfortable and practical for your baby boy. Perfect! An adorable matching tie complete his little gentleman look. It’s made from the same gray ‘cashmere’ material, is removable and pre-tied. So cute! The Derek Cashmere Gray Baby Suit is available for purchase here. Don’t forget to add these sweet ribbed socks and matching shoes! 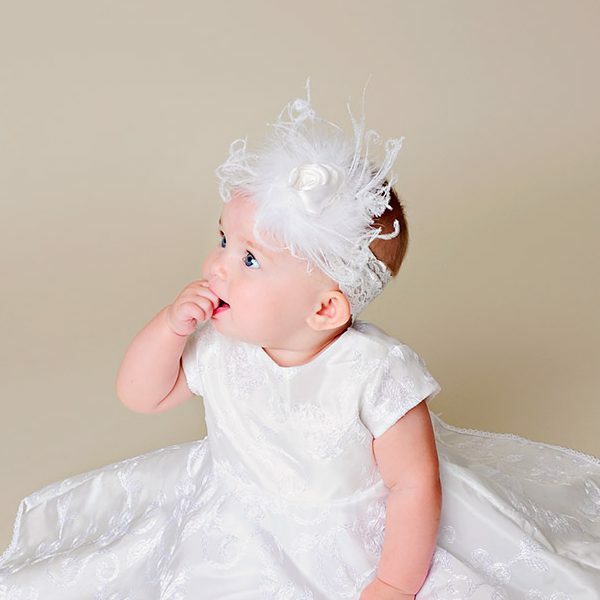 Looking for the perfect First Birthday Dress? 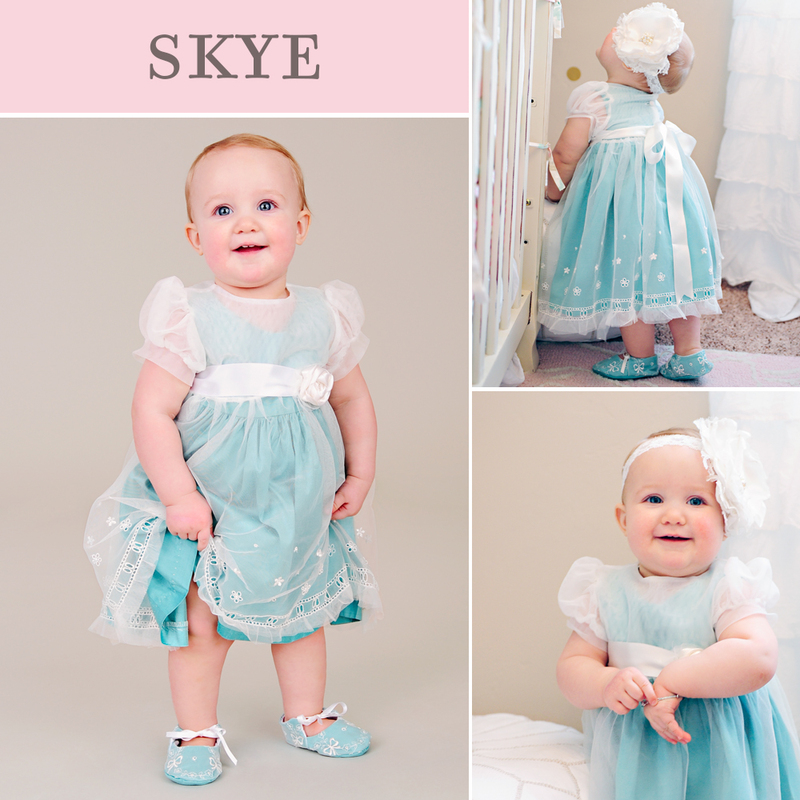 Check out the Ruby Party Dress from One Small Child! You can never go wrong with a little bit of sparkle and a whole lot of pink! Lace trim adds a little sparkle to the waist and sleeves of the Ruby dress. Embroidered flowers are adorned with hand-beaded clusters. An assortment od white, clear and pearl beads add flashy shimmer. Luxurious pink dupioni silk fabric is fit for a princess! In case you haven’t heard, dupioni silk is a subtly textured fabric that’s woven from a double strand of silk yarn in a plain weave pattern. The yarn is uneven and varies in width, creating a series of natural horizontal “slubs”, which make up the unique character of the fabric. It’s light-weight and comfortable for your little fashionista. 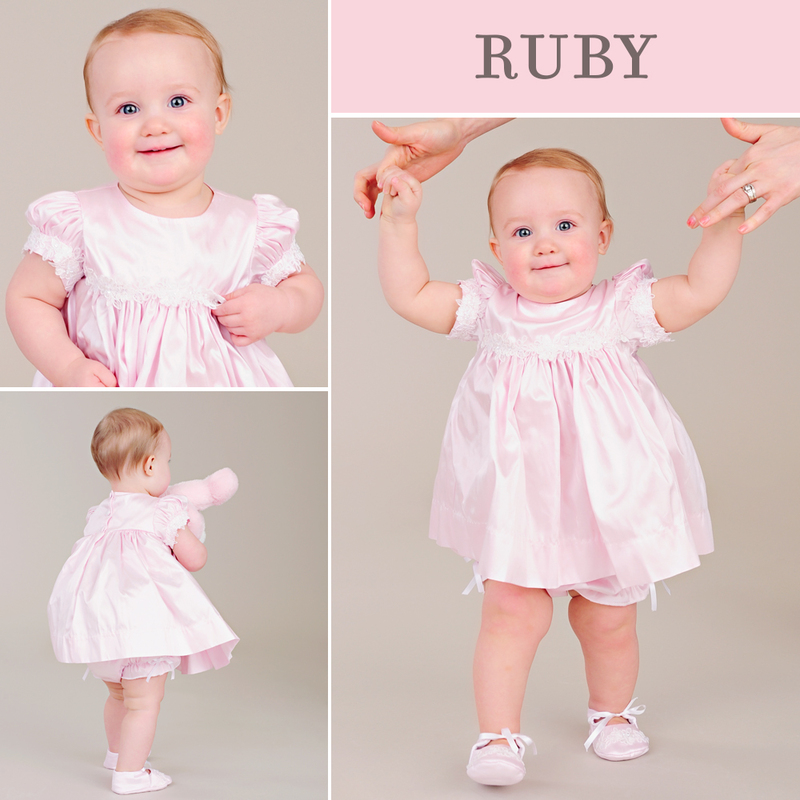 The Ruby Dress is perfect for your mobile baby. Crawling and walking is no problem in this above-the knee dress. The bloomers will keep her diaper out of sight. Made from the same pink silk, it matches perfectly. Add our Ruby Shoes to complete her party look! Lined with cotton flannel, they’ll keep her toes cozy and comfy. Made with the same pink dupioni silk and beaded embroidered lace, these crib shoes match the Ruby Dress flawlessly. A silk ribbon tie keeps them comfortable in place. 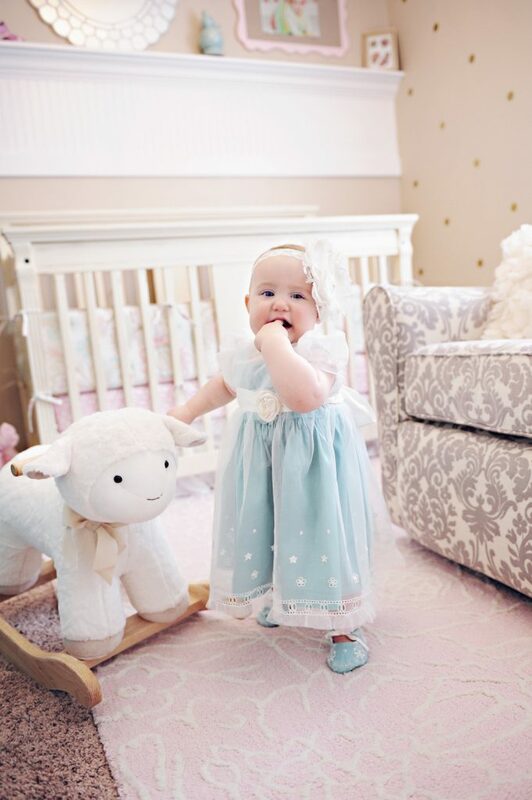 Have you seen this adorable first birthday party dress? Our Skye dress has all the details a girl could want! 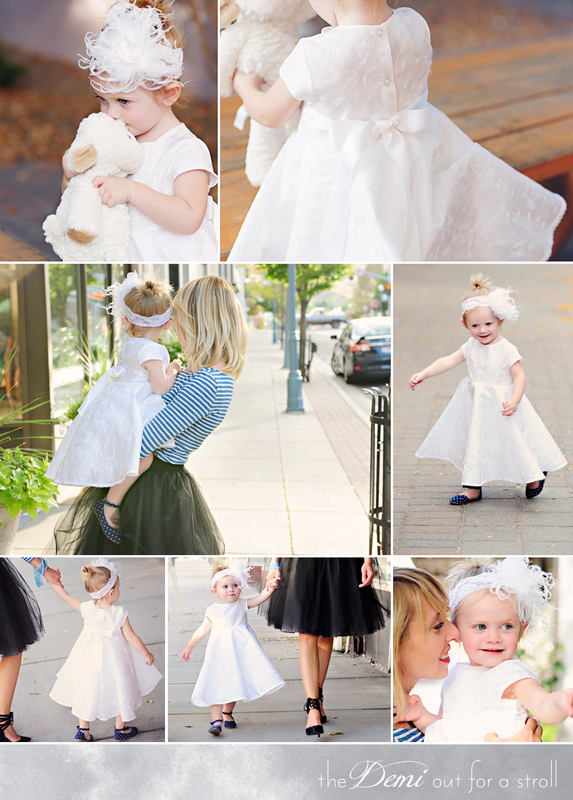 Perfect for your little princess’ special day! The sleeveless underdress is made from aqua blue dupioni silk. It offers a simple backdrop to allow all the details of the over-dress to shine. For a little background info, dupioni silk is a subtly textured fabric. It’s woven from a double strand of silk yarn in a plain weave pattern. The yarn is uneven and varies in width, creating a series of natural horizontal “slubs”, which make up the unique character of the fabric. We can’t get enough of this deep, rich color! The over-dress is a classy tea-length style that ends below the knee on most. It’s made from embroidered lace netting. Three rows of pretty embroidered flowers decorate the skirt. Dainty lace cutouts allow the vibrant aqua silk to shine through. The hem is finished with raw-edge netting. Puffed sleeves and a silk ribbon sash add pretty design elements. A hand-made silk rosette is placed off-center at the waistline. Silk-covered buttons back closures. Finish her celebratory look with the Skye shoes! Made from the same rich aqua silk and embroidered lace, they’ll match her dress flawlessly. We also recommend our Shorty Slip and Bloomers set. Made from a soft cotton broadcloth, this slip is designed for comfort! Don’t forget to add a pretty headband to top it all off. Your little princess is all set to steal the show on her special day! Your little angel is going to look amazing in this cute pink first birthday dress! 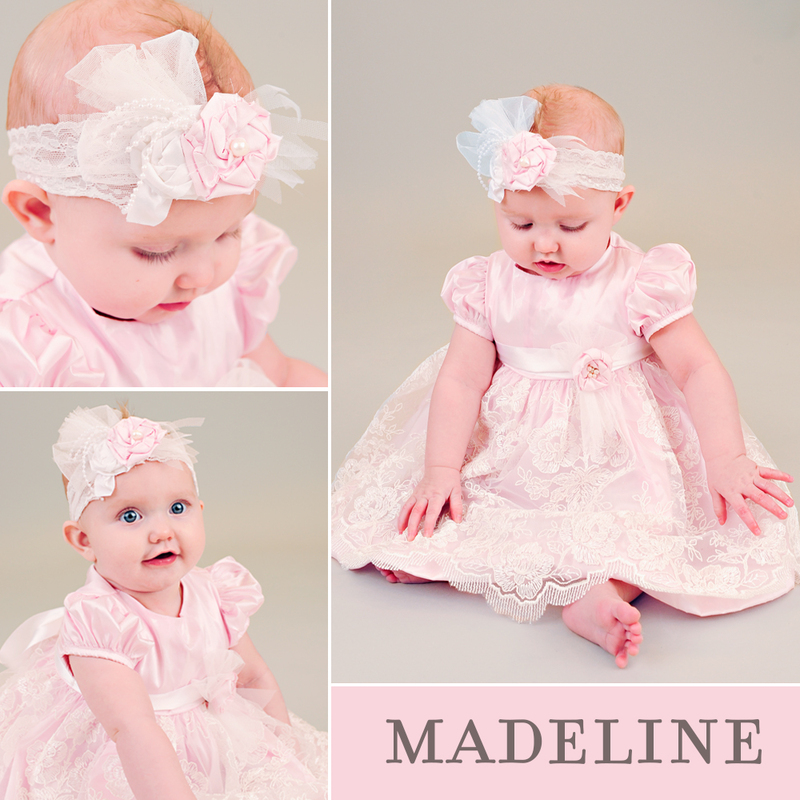 The Madeline party dress is a wonderful choice for all her special celebrations! High-quality re-embroidered lace graces the skirt of this party dress. The texture of this off-white lace is amazing! In case you haven’t heard, re-embroidered lace is a fine needlepoint lace. Filled-in motifs, outlined with a heavier silky cord creates a raised outer edge. The floral motifs stand out on a sheer net background. It’s the finest of textiles! The bodice and skirt body are made from a rich pink dupioni silk. Dupioni silk is a more subtly textured fabric. It’s woven from a double strand of silk yarn in a plain weave pattern. The yarn is uneven and varies in width, creating a series of natural horizontal “slubs”, which make up the unique character of the fabric. A gorgeous hand-made silk rosette is off-center over top a wide silk ribbon sash. What’s a party dress without puffed sleeves and a flared skirt? The subtle stiffness of the materials and construction maintains the pretty shape without being uncomfortable. Can we just say this dress is amazing? To complete her look, a matching headband is included. It’s made from a soft, wide lace band. Topped with two hand-made silk rosettes, beading and tulle netting. So adorable! Celebrate your little gentleman’s big day in style! 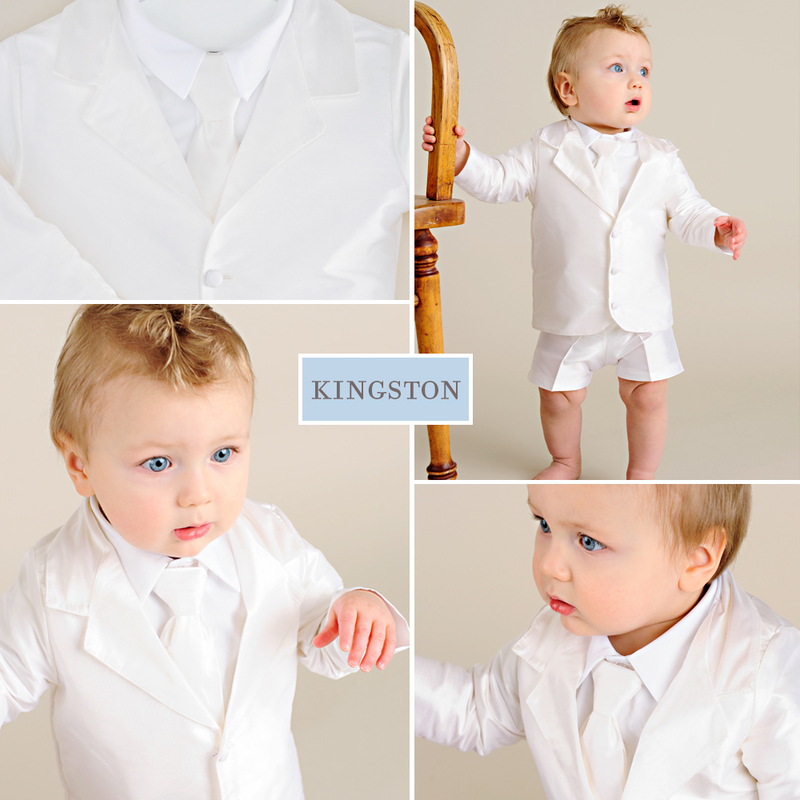 The Kingston is an adorable first birthday suit set in upscale silk. We love the versatility of this suit set! It offers a refined, formal feel all together. Remove the jacket and tie for a laid-back look. Add the hat for some little-boy fun. He’ll be the star of the show in this posh suit! The Kingston is a five-piece suit set that includes a jacket, shorts, bodyshirt, hat and tie. True to a little man’s styling, the bodyshirt is made from a soft combed cotton and buttons up to a pointed collar. Short sleeves make for easy layering. A snap crotch closure allows for quick diapering. The jacket, shorts, hat and tie are made from luxurious dupioni silk. It’s a rich material that is made by weaving a double strand of silk yarn in a plain. pattern. The yarn is uneven and varies in width, creating a series of natural horizontal “slubs”. These make up the unique, rich character of the textile. It’s lightweight, making it just right for his warm-weather event. Three silk-covered buttons fasten the jacket front. The silk shorts are a flat-front design with an easy-on elastic back. The silk tie is removable for versatility. A visor beret hat tops off his little boy look. How handsome! Add our ribbed ankle socks and silk booties to finish his little man look. These adorable little socks are just like dads, featuring a simple ribbed design. They’re even machine washable (you’re welcome mom). Our silk booties are made from the same dupioni silk as the Kingston suit, so they’ll matches flawlessly. They’re fully lined with a thick and cozy cotton flannel. A thin silk ribbon ties over the tongue. Dress your little tyke in a birthday outfit that fits his playful personality. Our Johnny first birthday outfit has a ‘boy at play’ feel. Perfect for your little boy’s style. We love this over-all style outfit! The rigid shantung fabric holds its shape well for a look to last all night. It is fully lined with a soft cotton for comfort. Large covered buttons lend to the masculine design. A collared button-up bodysuit is layered neatly beneath. 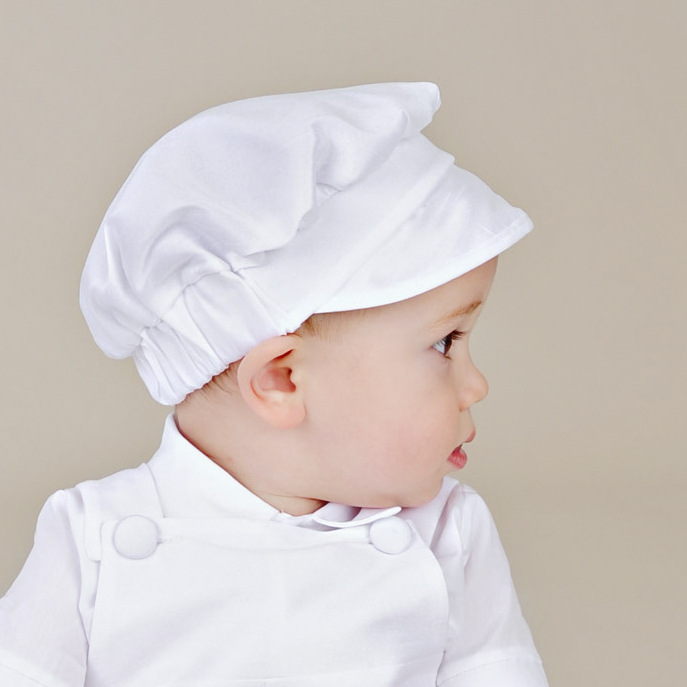 This three-piece set is topped off with a playful visor beret hat to match. 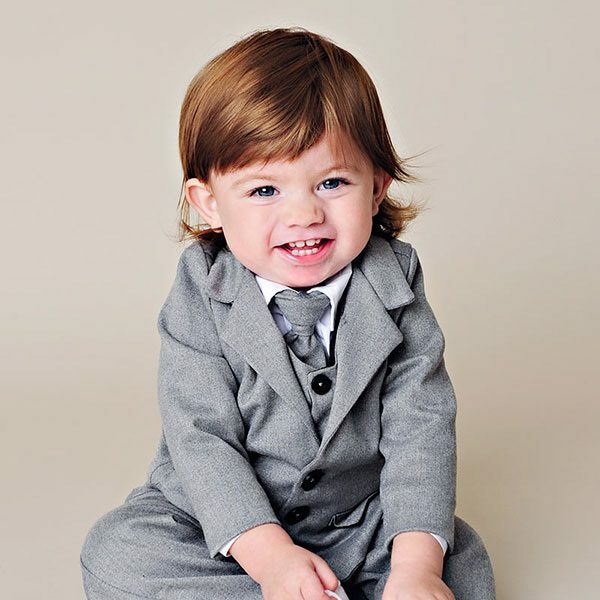 Your little man will look so adorable on his big day! 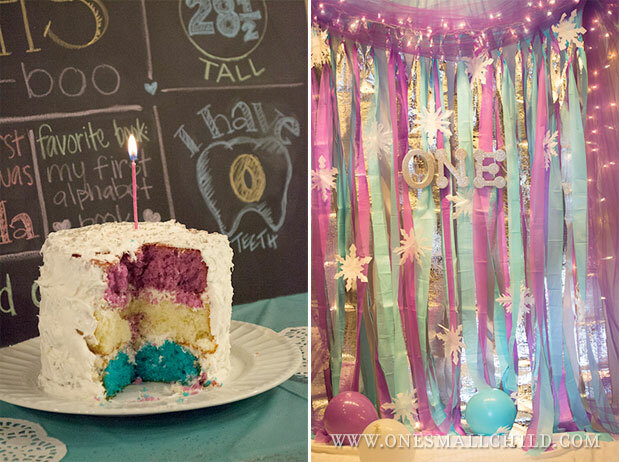 “I chose the Winter ‘One’derland theme because it fit my daughter’s January birthdate, and it was specific to a first birthday. I liked the trendy color combination of silver, light blue and purple. So I chose them to base my decorating on. I’m very practical, and I knew I could easily find everything I needed in these colors. I don’t like to stress over these things! “I recruited my sister (a great cook) to bake a home-made cake for Josie to smash. She did layers in the theme colors of blue, white and purple. Then, decorated it with white whipped frosting and silver sprinkles. It was just what I wanted-simple and delicious! She also made colorful cupcakes with the leftover batter from each layer. We served the cupcakes to the guests with some blue punch and left the smash cake all to the birthday girl. 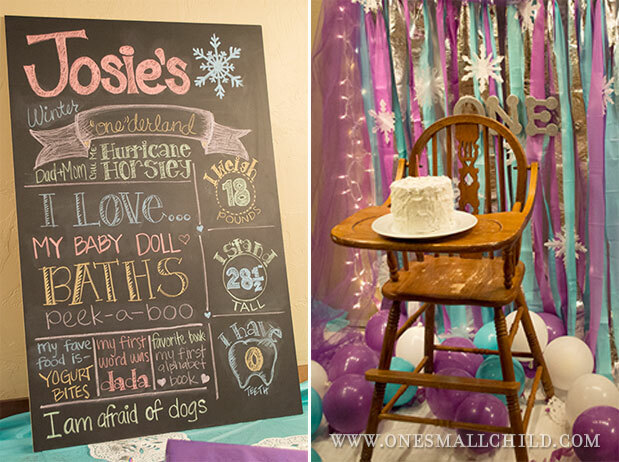 “My mom saw the chalkboard idea, and I loved it! I’m kind of a perfectionist, so I made sure to draw it well in advance. It was a little time consuming, but everyone loved it. I felt it was worth it to display some fun things about Josie’s personality. “The order of events went like this: after the guests arrived we sang happy birthday to Josie. She was so excited to see all her family. I let her open her gifts first-mom and dad and both her grandmas helped a lot with that. It was sweet that she got to open several gifts with the help of those who gifted them. She loved all her clothes and toys! 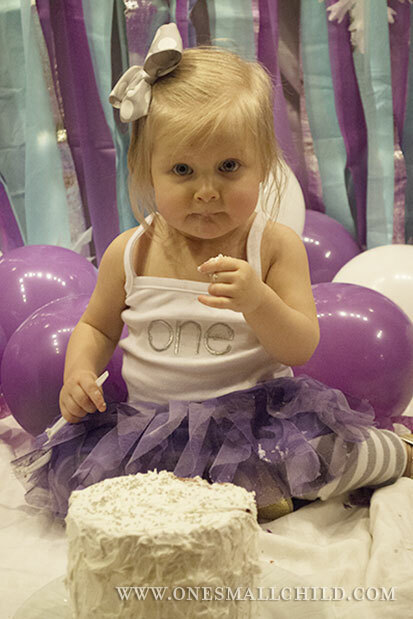 We saved the cake smash for last, since I knew she’d be messy afterward. We let her dive in and then served the cupcakes and punch to the guests. Afterward, everyone visited while the kids (and a few dads) played with the toys and balloons. It was all very laid-back and simple.